Things are much calmer today. Charlie started acting normal after I double bagged the carved box of ashes (thanks to who made this suggestion) and put them in a drawer. My doctor ordered some anti anxiety meds for me, and I’ve been able to keep food in my stomach. Charlie is eating and drinking. Not needing his pain meds right now. I am so grateful that my little boy seems okay. I want you all to know how much I appreciate the help you gave me yesterday. It was just what I needed and helped immensely. I cherish your advice. I will be picking more cucumbers soon. I share the cucumbers and peppers with my next door neighbors. 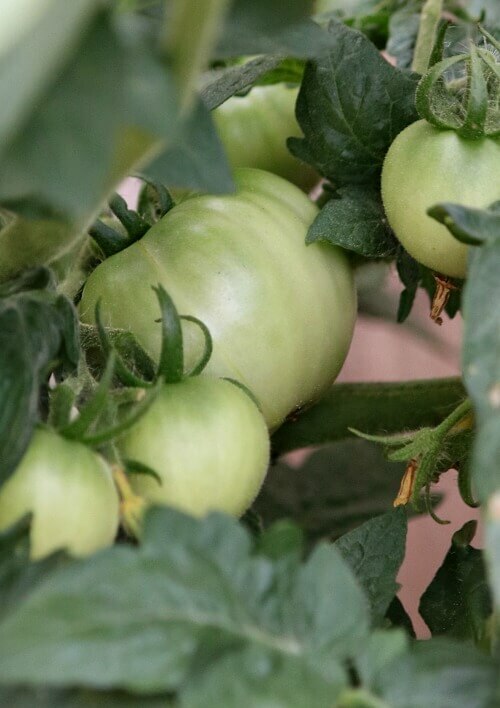 Soon I will have ripe tomatoes. I just got a smoothie blender I want to tell you about, because it’s so handy and quite cheap. I haven’t made hot coffee in weeks, but I wanted to be able to have iced coffee. I love caramel iced coffee. But my blender bit the dust a few years ago. I didn’t need a big blender taking up space on my kitchen counter. 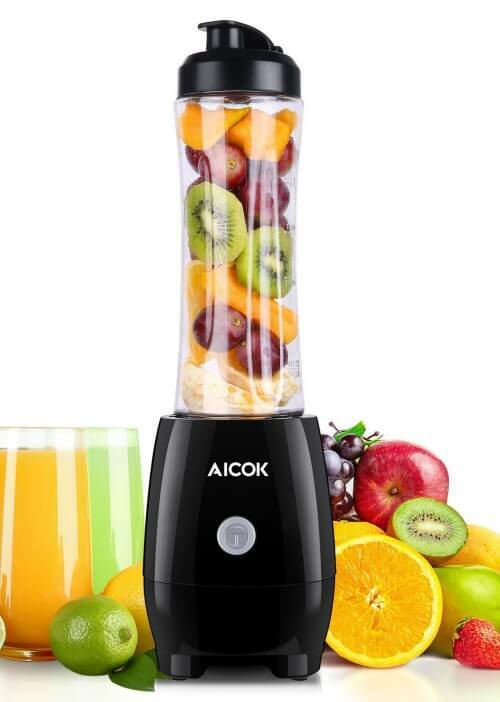 Then I came across this Aicok smoothie blender on Amazon.com. I wanted it for iced coffee and protein smoothies. At $22.99, I thought it was a good budget pick and it had five star reviews. A Budget Pick for Healthy Life: 300W Turbo Boosting Motor enough to tackle most tasks, like personalized smoothies, juice, baby food and more. Detachable Blade Assembly: Easier to clean than most personal blenders. 20oz Tritan BPA Free Bottle: Dishwasher Safe and Better for single serving. Replace the blade lid with the resealable travel lid to take your smoothie on the go. Safety Lock Design: Press down and twist the bottle to click into the LOCK place, so that the unit will start. 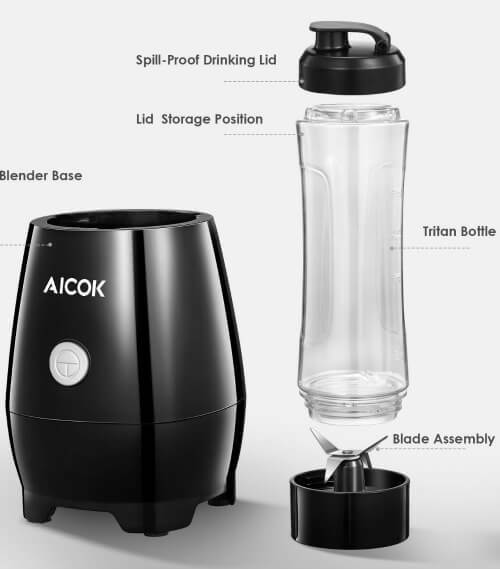 You just take off the blade assembly and fill the bottle with your drink contents. Then turn it upside down and screw it on the blender till it locks, and blend. It comes with a drink lid that is handy. I am not an associate for Amazon or making anything off this. I just wanted to share what I considered a good deal. If you like to make your beverage and take it with you, this is a very nice set up. 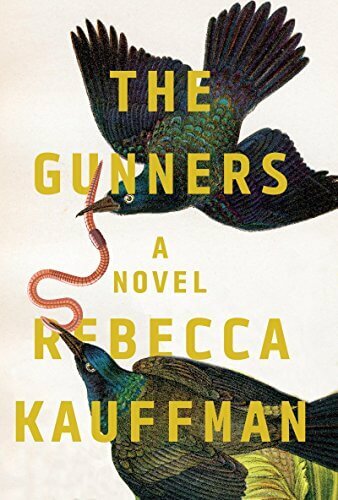 I am currently reading “The Gunners.” Gunners is the name of an abandoned house where someone with that last name used to live. A group of children start using this house as their club house. I am thinking about maybe getting a rescue cat at some point. Charlie lived his first five years with cats. I don’t know how he’d be with one now. I don’t want him to feel crowded. But I wonder if he would bond with a cat now? He was submissive with Abi, so I wonder if he would also be submissive with another pet? I hope that wouldn’t be the case. I get online and look at pets at the shelter, and their homeless state is so terribly sad. But I’m only allowed to have two pets here. I hope you have a nice weekend. I have plenty of groceries and am planning to just be with my Charlie boy. First comment….it’s not Friday, ha ha it’s only Thursday!!! 🙂 You’re like my sweetie – he forgets what day it is at times, if I have an extra day off or work a weekend day it screws him all up! I’m so glad Charlie seems better – see, there must be a smell that he can smell even if the vet and you can’t. I read that a dog’s sense of smell is like 5,000 times more intense than ours, or some crazy number like that. Hope you can relax and enjoy your pretty patio now that Charlie is doing better, my friend. I could have sworn it was Friday! I changed the post title. Thanks! Good news, You sound much better and I am glad to hear that Charlie is doing ok too. Stocking up and staying in sounds like a great idea. Have a great weekend Brenda. Take it easy! It’s hot here now. We’ll stay in and wander the patio when we get restless. This is good news! I am happy that both you and Charlie are feeling better. Your garden is bursting with goodness. I cannot believe how fast your veggies are coming in. They look delicious. Enjoy your weekend with Charlie! So glad to read that you are starting to relax a little & found a new way to eat. Smoothies are so good & I’m sure you will enjoy not only the taste, but the benefits also. I was wondering a couple days ago if you would get a second animal. Didn’t say anything because I wasn’t sure if you were ready for that or not. I guess when you are ready, you are ready!! Stay well my friend!! I’m not ready yet I don’t think. I’m really worried about Charlie’s reaction. Brenda, if your heart is leading you in that direction, adopt!! Best wishes to you and Charlie. If I just knew how Charlie would react. And I need to pay off some bills first. So glad to hear that Charlie is better. I was out of pocket yesterday and missed how he was acting. But I can deduce that it was because he was probably aware of Abi being near by. AT any rate. Just happy he is not in any pain and is acting more like himself. Have a good holiday weekend. There are so many pets that need a home and I think a cat is a good idea. But—give Charlie a little time for one-on-one with you and space to heal. I’m go glad you are doing better day by day. That’s my thought too. Not yet. Sounds like a nifty blender. Glad Charlie is better today. I know that when my loved ones hurt, I hurt and when they improve, so do I. Your vegetables must be delicious! Enjoy your weekend. Oh they taste so much better than the produce from the store. You might look into some you tube videos by Teresa Venette. She goes by Kitten Stitcher. She has Done kitten fostering and rescue for years and loves cats. If you left a comment asking about her views on bringing them into a home with an older pet( she has older cats also) she might be of help. I’m sure she would talk with you, she is sooo kind. She used to own Shakespeare’s Peddler and designed for raise the roof designs (cross stitch) so you may know of her. I don’t happen to know of her. Will check this out. OMG! I cannot believe how big your vegetables are! Lucky girl! In WA state my daughter just planted her garden last week. They worry about a late frost there. I can’t believe how fast they’re growing either. Overnight there is quite a change. I LOST BUTTONS MY PEEKAPOO RESCUE WHEN WE LIVED IN TULSA, I GOT A LOVELY BRASS URN FOR HER FINAL RESTING PLACE. THEY ARE SEALED AND I HAVE NEVER HAD ANY PROBLEMS WITH THE URN AROUND MY OTHER BABIES. SHE WAS TERRIFIED OF STORMS, I FIND COMFORT ( it does come) HAVING HER NEAR, I CAN PAT THE URN OR EVEN HUG IT AND TELL HER, SHE DOES NOT HAVE TO BE SCARED ANYMORE. WHEN WE LOST CHELSEA YORK, OUR 1st YORKIE I GOT A LOVELY STERLING SILVER TEA CADDY FOR HER ASHES. SEVERAL YRS. LATER WHEN WE LOST SISSY SUE, WE ADDED HER ASHES TO THE CADDY. I WANTED THEM WHERE I COULD SEE THEM, TALK TO THEM AS THEY WERE AND ARE STILL A PART OF OUR LIVES. YOU MIGHT GIVE SOME THOUGHT TO GETTING A URN, THIS WAY IF YOU WANT IT OUT WHERE YOU CAN SEE IT, YOU CAN. I DID NOT WANT THE ASHES IN A DRAWER OR ON A CLOSET SHELF. I KNOW YOU DID WHAT YOU HAD TO DO FOR SWEET CHARLIE (and I would do the same) BUT THERE ARE OTHER SOLUTIONS THAT MAY WORK FOR YOU ! I’m hoping Charlie’s reaction to the box of ashes are temporary. I don’t want them hidden away. I agree. Charlie and I are growing even closer. I will have to decide if he would even welcome a companion, and I don’t know how to do that. It is Charlie’s time in the spotlight now. I smiled when I read this post; sounds like you and Charlie are feeling pretty darned good! 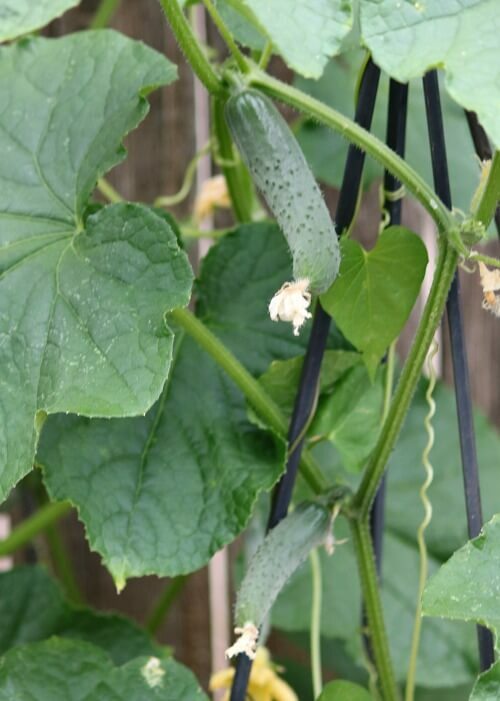 Your vegetables look so great; I love most anything fresh from the garden and it seems like cucumbers and tomatoes are two of those that taste so much better from the garden than from the grocery store. The small blender is definitely in my Amazon cart; love the size of this and the reviews are really good. Glad this was included in your post today. Take care . Enjoy the patio and Charlie. When you are ready, a rescue cat might just be the answer. The furry crew I have now is all rescues — two dogs and a cat. One of the dogs can be very hard to control at times (Gemi is all or nothing!). But he fell in love with our cat; the two are best buddies and Gemi knows to be gentle with the cat. And there is no competing for my attention. Maybe a cat will be a good campanion for Charlie. I saw a rescue cat online today (I can’t help myself in looking; seems to cheer me a bit after losing Abi) that had to have all its teeth pulled. I thought: Well, that would be a perfect match for Charlie who only has two teeth. They couldn’t bite one another. But…not yet. Good luck with everything. It’s a hard time for both of you. The blender looks nice. I like smoothies, but they are too many calories too fast, even if they are full of fruit. I try to chew my fruits and vegetables–it takes longer, and has more fiber. But iced coffee–so good in summer!!! I’ve had iced coffee this morning and then a banana smoothie a bit later. I love having such an easy way to make them without having to have a big blender. And also that it’s so lightweight. Doesn’t hurt my hands to deal with it. I am so happy to hear that you and Charlie are doing better today..Prayers are answered…(Oh, and I thought it was Friday too). When we had Toby (fox terrier) we got a rescue Cat, when he was older, maybe 9-10. Terrier’s can be sassy, but, Toby was not ever, even tho he chased squirrels out side, (never did catch one tho). The two got along fine. Sometimes the cat would swat Toby on the nose, when she walked past him, and he allowed that. It was funny to see, but he pretty much ignored her. Sometimes they slept together in his basket. Not often, but it did happen. I have my days mixed up lately. Not sure why. Great news to see you and Charlie are feeling better. He just needed some time as did you. I remember when you rescued the cat that wouldn’t come out of hiding! We just rescued a 5 wk old kitten. My friends dad waskeepi g it in the house. He’d taken it away from its Ferrell mama. Then he had a stroke. So we took her. She is ruling the roost already and it hasn’t been two weeks since we’ve had her. My 10 yo Morkie, Ziggy, was a little upset at first but now it’s ok. And my older cat is playing With her. Give yourself some time. I know you love all pets. I like pets more than people. And I’m certainly more relaxed around pets. I think of a kitten, then I think of an adult cat that has no home and less chance of being adopted. I just don’t know yet. I think I’ll know when and if it’s time. Charlie just gets so upset when I go out, and I’ve only left him a few times. I was just wondering if that would help him, having a companion. I am so very glad that you and Charlie are feeling better. 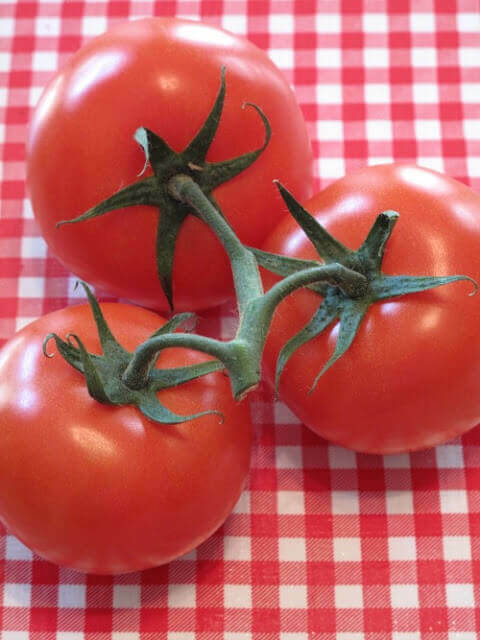 Nothing tastes better than fresh veggies from the garden, especially juicy, ripe tomatoes. Some of ours are blooming, but that’s it for now. If you are not sure how Charlie would react to another pet sibling, maybe you could foster a kitten or puppy to see how he would be. Our Shiztu rescue was fostered by a wonderful lady and we are so thankful to her because Lollipop is such a sweet little girl. I would have to have a “try out” with him around a cat to see how he responded before I adopted. He and I are just enjoying each other’s company right now. Do you know anyone with a cat or kitten? Maybe you could do a controlled meet and great. I don’t right now. I could ask around at my vet’s office. I am glad someone mentioned about the ashes. It may not bother you but I do not like carrying in the litter or out the old when I clean or sift the boxes. But then we do have 3 cats. So sorry about sweet Abi. I had to take anti anxiety medication when our small poodle passed. Time does seem to help the heart. Best to you and Charlie as you carry on. Yeah, taking care of a litter box again is not an inviting thought. I am glad things are calmer and better for you and Charlie today. When the vet said there would be no odor with the ashes I’m sure he meant that humans would not notice. Animals can smell so much more than we can and I bet it was confusing Charlie. It is good that you found a solution that seems to work. I will be curious in hearing how you use the blender. I have thought of making protein shakes because I eat very little meat and know I should have more protein. What kind of protein powder do you use and does it bother your stomach? I hear so much about healthy shakes we can make but I’ve never made them. I hope you and Charlie enjoy the rest of your day and weekend. I ordered a protein powder when I ordered the blender. But I won’t order it again I don’t think. It was pricey. I will have to find a cheaper alternative. No doesn’t bother my stomach. It seems like your garden is flourishing and you will feel better in time too. You certainly have a green thumb Brenda with all your beautiful flowers and plentiful veggies! Have a great weekend and try to relax and enjoy yourself too with Charlie! We are just staying in and puttering around. Charlie is always close to me. Garden is beautiful! I love picking and eating something I have grown. I also loose track of days. I think it is because of always being home. Best way to spend my time also is with my pups Centa and Baron puttering around the yard and house! You and Charlie have a good day and night! I think so too. My days tend to blend together since I’m home so much. So far, no problem with the squirrels and my veggies. Not last year or the year before either. Oh Brenda, forgot to tell you, that the cat I rescued, was an older cat, that nobody else seemed to want. I’ve had a couple of others through the years also, and I always pick an older cat because they have been in the shelter so long, and are more laid back, and don’t really jump on the counters, or tables.. They just seem happy to have a forever home. Usually they just sleep on the back of the sofa, or in their own bed, or with me. Kittens, I think are so cute, but pretty active, and into every thing. Just a thought… Anyway, I read today, that a person has 30% less chance of having a stroke or heart attack if they own a cat. Who knew? Got to thinking yesterday after I read your post, maybe he is picking up on your sorrow and sadness? Just a thought. Your planters are so lovely. You’ve given me inspiration to get my act together on my front yard pots. I am so happy to hear that you and Charlie are doing good. ‘The Gunner’ nice book, I have read it and I’m sure this will help you in many ways. Brenda, I am so glad things are going better. Charlie is so close to you – undoubtedly he is feeling your pain and loss as well as his own. Just as you need time to heal, so does he. Good for you for getting anxiety meds. Be ever so kind to yourself and grab comfort where you can. That’s what I do for myself when I visit here! As far as adoption, I would wait a while. We adopted the day after losing our Cocoa, and honestly, it was a mistake. It ended well after many months of dealing with a new family member who never attached, never played, etc. But we gave her a good home and are happy about that. May I suggest when you do decide to adopt a sibling for Charlie that she be calm and perhaps a little docile? Here’s what a few of my neighbors do with smaller dogs (Charlie’s size). They’ve bought doll strollers and small baby strollers and push their dogs around in that. The couple does quite a bit of just walking (we are very flat here) and when the pups get tired, they just put them in the strollers. That way everyone gets some outside activity. They said one of the pups even likes to get in it at home, very cozy, I guess. As to a new pet – I wouldn’t push it. Tried it once, did not work at all – wetting/hiding/crying. Had to return the new one. Waited a year, and all was good the second time. Charlie just needs to get used to his “new normal”, which takes a while. And, I think you’re right about double bagging the box – their sense of smell is fantastic! Plus, he just misses her too. Hi Brenda, I didn’t read all the comments so I don’t know what everyone else is saying but cats can be so temperamental and you would have to have a litter box no? If the litter box doesn’t bother you then maybe a kitten or just a younger cat, I think Charlie and a younger can would bond more easily than an older cat. What about a younger dog? I haven’t read yesterday’s post yet, so I don’t know what happened with Charlie and the ashes (I’m assuming he was afraid of them?) so I will have to go back and read yesterday’s post. I had to, of course, go on an anti-anxiety med after my son died, but I only needed them for about a year and then I was able to wean off. Glad things are better! I think rescuing a cat sounds wonderful. Hope if you decide to do this it will work out great for the both of you!